Absolutely bonkers brilliant, can’t wait to see how this works out. Thanks Michael. 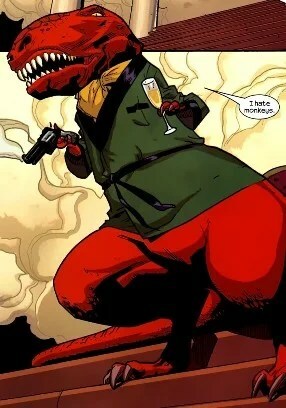 Whilst it’s a little early for “Dinovember”, I had a feeling you’d appreciate it. We’ll have to see if my skills match my ambition, but it will certainly be fun finding out! The mold line at the waist is actually a join – he’s hollow. It’s also going to be covered by the smoking jacket, so I’d leave it. Repositioning the arms should be relatively easy too – the PVC will slice and pin handily, and the sleeves will cover any imperfections. You’re spoiled for choice on adding clothing – basically anything not heat-activated is fine. Glue-soaked tissue if you don’t feel confident sculpting. Some kind of bead for the champagne flute. I think that GW’s Orks had some oversized pistols that may work. This should be fun! talk about one extreme to another , think you might have to mix up a bit more milliput than you did with Orko for this one, mate! Best of luck, can I give you one piece of advice? if you can get hold of an old “eyepencil” brush, the rubber tipped type, my wife had one from Boots “No7” range, it was attached to the back of the pencil. I pinched it once she’d used up the pencil. It’s basically a bigger version of the black tipped putty tool poking out from behind Sceletor’s head at the top of my blog header. This is an essential when trying to get a smooth finish on clothes etc.. dip it in a little water to dampen the tip and it will work wonders..
you can probably buy them cheaper elsewhere (the range might have some). “There’s nothing you can achieve with a wet finger, that you cant do better the proper damp tool ! !” Oh behave! You should know by now that I’m “cost effective” (I.e. cheap), so wouldn’t be looking to pay full price for a proxy tool. I will be dropping into The Range on the way home, as I’m sure I’ve seen packs of these tools in there without realising what they were. Previously all my sculpting has been done with fingers, craft knives and toothpicks – just imagine what I could achieve with proper tools! Don’t knock the humble cocktail stick! I use them extensively, and am always picking up more each tome we go to “Costco” at least that’s my excuse for eating all the free samples I can get my hands on! the “cocktail sticks! !” (yea right). It was The Works. Four silicone tipped colour detailers for £3. Bargain! Bring on the putty! Great stuff Jez, and I’m really looking forward to seeing how this turns out. 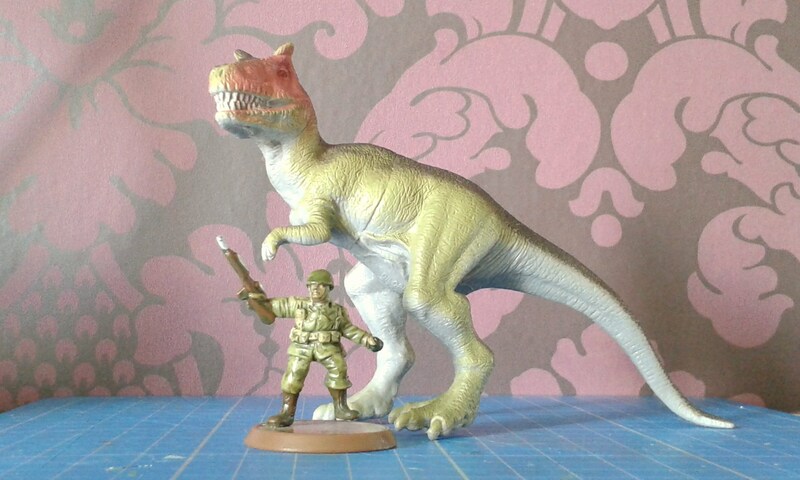 I think your version of Devil Dinosaur is far closer in size/shape to that depicted in his current adventures fighting alongside Captain America on “Planet Hulk” – I’ll be reviewing #1 very soon. Thanks very much for the shout out too – much appreciated I assure you.